It is truly amazing how much natural beauty can be found in our yards. We see it in butterflies, moths, flowers are far too many other plants and animals to mention here. Why, it can even be seen in dragonflies. Yes, I said dragonflies. If you never thought of dragonflies being attractive, it is to take a closer look at them. Dragonflies come in a rainbow of colors and sizes. In addition, the intricate designs formed by the veins on their wings are as stunning as the finest lace. 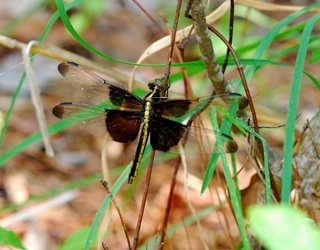 One of the most striking dragonflies that can be seen in backyards throughout the entire state, with the exception of Southeast Georgia, is the widow skimmer. This dragonfly is about an inch and a half to two inches long. It’s distinctive wing pattern (see accompanying photo) makes it easy to identify. The body of the adult male is blue. In comparison, females and young males display pale stripes running down their bodies. Also, the tips of the wings on females are usually black. Males will often perch on the ends of twigs and other objects and then slowly patrol your yard. 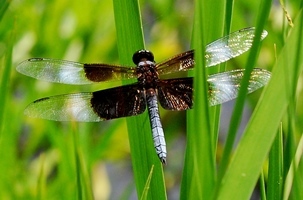 This dragonfly flies from May to early November. QUESTION: HOW DO I KEEP MY BUTTERFLY BUSHES BLOOMING THROUGHOUT THE SUMMER? The butterfly bush earned its name honestly. This perennial shrub is a butterfly magnet. 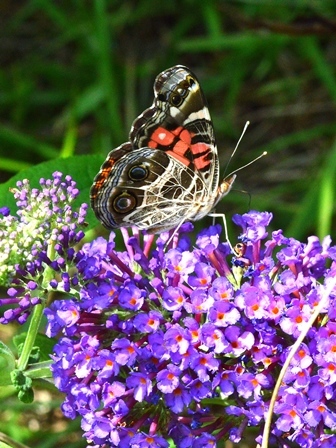 When a butterfly bush is in full bloom, it will often attract more butterflies than any other plant in Georgia backyards. However, if you want a butterfly bush to continue producing a bounty of blooms that will feed colorful butterflies throughout the summer, regularly prune the shrub’s spent blooms before they produce seeds. This procedure is called deadheading. The best way to deadhead a butterfly bush is to snip off all spent clusters of blooms down to just above the first set of leaves below flower. This can be best accomplished using a garden pruner or pair of scissors. QUESTION: Is it possible to tell a male from a female monarch butterfly? It sure is. 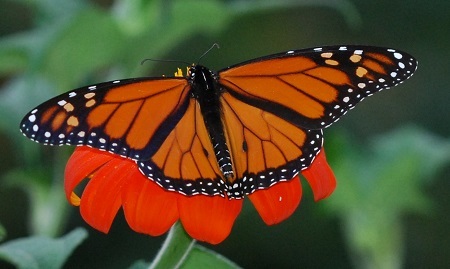 All you have to do is to catch a glimpse of the top side of a monarch with its wings spread. Male monarchs will sport a dark spot on one vein running down the hind wing. Female monarchs do not this spot. The monarch shown is a male. In spite of the fact that the red-bellied woodpecker is commonly seen in Georgia backyards, it is a bird that has an identify problem. While it is true that this common woodpecker is one of our most recognizable backyard birds, all too often it is called a red-headed woodpecker. The truth of the matter is just because the bird’s crown and back of its neck are scarlet red doesn’t make it a red-headed woodpecker. The true red-headed woodpecker’s head is entirely red. I, like many of you, probably wonder why a bird with nothing more than a faint reddish wash on its belly is called the red-bellied woodpecker. It seems to make more sense to name it after some more recognizable feature. Several years ago, I showed a picture of a red-bellied woodpecker to an elementary class in Grovetown. When I asked the students what they thought the bird was, one youngster piped up that he thought the bird should be called the red-necked woodpecker. I thought that was a great answer. I know one thing for certain, it makes more sense than calling it a red-bellied woodpecker. Another feature that stands out on the red-bellied woodpecker is its back. This woodpecker’s back displays a zebra-like pattern of white and black feathers. 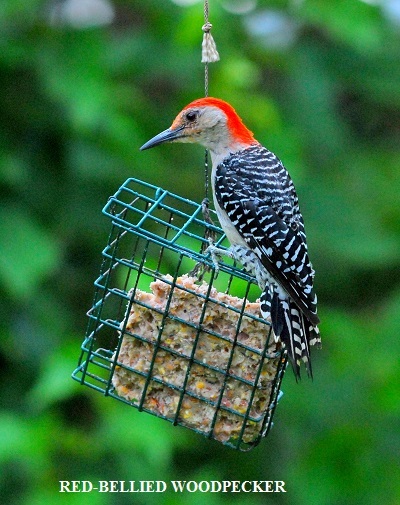 The red-bellied woodpecker is a permanent resident in the Peach State. It is commonly found both in woodlands and wooded yards in towns, cities and suburban areas. The 9 1/4-inch bird can be attracted to yards by offering it suet and black-oil sunflower seeds. Like all cavity nesting birds, it is suffering from a housing shortage. The red-bellied woodpecker excavates it nest site in dead trees. The problem is that such trees are becoming increasingly more difficult for the birds to find. This is especially true in urban/suburban settings where dead trees are often cut down. If you have a dead tree in your yard that does not pose a threat to humans or property, consider leaving it standing for red-bellied woodpeckers and other cavity nesters. Recently when I moved a dog house in my backyard I uncovered either an adult five-lined (Eumecus fasciatus) or southeastern five-lined (E. inexpectatus) skink. I wasn’t sure which one I had disturbed because both are found in my neck of the woods, and the lizard scampered away before I could closely examine it. The five-lined skink ranges across the entire Peach State. However, the southeastern five-lined skink’s known distribution is slightly smaller than that of the five-lined skink. 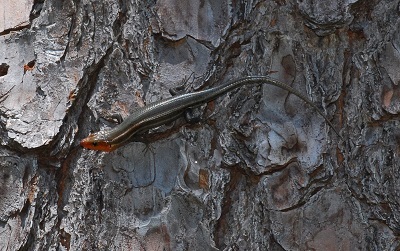 The southeastern five-lined skink has not been verified living in the extreme northwestern corner of the state as well as in a broad band of counties roughly ranging from the eastern portion of Murray County south to Pickens County eastward through portions of Dawson, Lumpkin, White and Habersham Counties. If you want to tell the difference between the five-line and southeastern five-lined skink, you are going to have to capture one. However, I should warn you that, if you try to nab one of these critters, it will most likely try to bite. If it is able to latch on to a finger, the critter will not break your skin. Once you have the lizard in your grasp, flip it over and take a look at the scales covering the underside of its tail. If they are all approximately the same size, you are holding a southeastern five-lined skink. On the hand, if the scales running down the center of the tail are much larger than the nearby scales, you are looking at a five-lined skink. Southeastern five-lined skinks are slightly longer (5.5-8.4 in) than the five lined skink (4.9-8.4 in). The juveniles of both species have 5 light stripes that run down the length of their bodies. 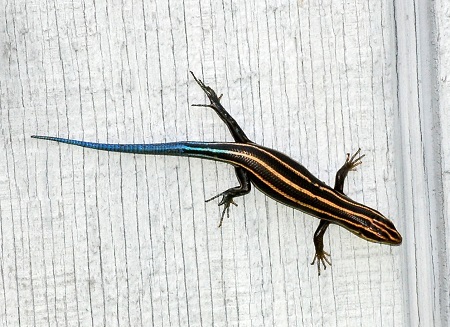 The middle stripe on the southeastern five-lined skink is often thinner than the other lines. The tails of these young skinks is bright blue. As these skinks age they gradually lose their stripes the blue coloring on their tails. In addition, their body colors will become brown to tan. Older female five-lined skinks will sport gray tails, On the other hand the backs of adult male southeastern skinks take on a bronze or brown appearance while their sides will be blackish. Skinks are commonly found in yards where they can find leaf piles, fallen limbs, logs rocks, and boards. Five-lined skinks prefer moist areas more so than southeastern five-lined skinks. Skinks devour a variety of small animals such as worms, insects, and spiders. QUESTION – My yard is mostly shady and I am having a difficult time growing nectar plants for hummingbirds. Can you recommend a plant that I can grow in my yard that is both attractive and will provide nectar for ruby-throated hummingbirds? Answer: You might be surprised to learn that the hosta might be the answer to your dilemma. Hostas are grown by Georgia gardeners primarily for their attractive foliage. As such, there is a wide variety of hostas available to the home gardener. These plants vary widely in leaf color, size and shape. Although some varieties will grow in the sun, most prefer partial to full shade. What is often overlooked is that they also produce beautiful trumpet-shaped flowers that are laden with nectar. These blossoms range in color from white to lavender. If are looking for a plant that will attract both hummingbirds and butterflies it would be hard to find a better plant than lantana. It is a hummingbird and butterfly magnet, prolific bloomer, withstands dry conditions, and requires little care. From the time they begin blooming in late spring to well into the fall, lantanas produce a seemingly endless crop of flowers that contain nectar prized by ruby-throated hummingbirds and butterflies alike. Believe it or not, there are more than 150 species of lantanas. These hardy plants are native to both the African and New World tropics. Some are shrubs that reach a height of six to 10 feet; others trail across the ground. However, one trait they all share is that they have woody stems. Throughout much of Georgia, lantanas are considered perennials. Although their leaves and stems are killed by frost, their roots are often able to survive and sprout a new crop of stems and leave each spring. With such a dizzying variety of lantanas to choose from, you are probably scratching your head trying to decide which is the best lantana for your yard. While I have tried a number of varieties, the one I prefer is Miss Huff. This variety can survive winter temperatures as low as 0˚F. During the past four decades, the Miss Huff lantanas growing in my Middle Georgia yard temperatures have survived temperatures as low as 4˚F. Other varieties do not do well at all when the thermometer dips into the 20s and below. Miss Huff is a shrub. The largest Miss Huff that I have ever seen grows in front of the Georgia Nongame Wildlife Conservation Section office in Forsyth. Each summer this giant reaches a height of five feet and measures more than 35 feet in diameter. In late August, it is not uncommon to see 12-24 rubythroats dividing their time between the feeders hung around the porch of the office building and the lantana growing nearby. At the same time, a couple of dozen butterflies are usually nectaring on the petite lantana blossoms. Miss Huff sports orange and pink flowers arranged in tiny bouquets measuring less than two inches across. Like most lantanas, its flowers change color as they age. Other varieties of lantanas display blossoms that range from white and purple, yellow and orange, pink and magenta and rose and gold to solid colors like yellow, white, red and pink. Plant breeders have developed a number of new varieties adorned with blooms in a kaleidoscope of colors. Here is a short list of some of these newcomers: American red, confetti, cream carpet, gold mound, Irene, new gold, patriot rainbow, radiation and white lightning. I should mention that, while some new varieties grow no more than two feet tall, they produce far less nectar than some of the older, taller types such as Miss Huff. One thing that makes them a favorite among gardeners is that they require little care. About all that you have to do is trim back the plant’s dead stems prior to the next growing season. Lantanas are not plagued by a host of insect pests or diseases. In addition, they require little water or fertilizer. In fact, if they are watered them too frequently and/or treated to liberal doses of fertilizer, they tend to produce more leaves and stems and fewer flowers. Lantanas will grow in both direct sunlight and partial shade. However, these hardy plants do best in open sunshine. One of the few negatives associated with lantanas is that, in some places in South Georgia, some varieties will escape into the wild. With that in mind, ask your county cooperative extension agent, or other gardening expert, which varieties should not be planted in your neck of the woods. Whether your yard is large or small, lantanas deserve a place in your landscape. 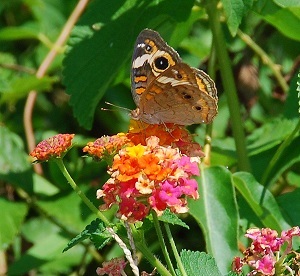 Once they become established, sit back and enjoy the beauty of the lantana flowers and the hummingbirds and butterflies that will frequent the nectar-rich lantana flowers.